Thought today would be good to do what I originally intended after fall quilt market. Moda fabrics makes up these sweet fabric packs for the designers to distribute during quilt market. I asked some of the designers if I could have a sample of their fabric to give away on this blog site. They were all very willing to share. Below are the ones I was able to collect. Leave your name and a comment and you could win these cute candy packs of fabric. There is only one winner. Contest will be over tomorrow around noon. The above picture is of our booth at fall Quilt Market. Barb took this with her iphone and it's not really a good shot ....but it gives you an idea of the quilts that will be coming out in our next book. We were planning to release the book this December but our plans have changed. The Kansas City Star will be printing this one for us and we are looking at a March release. Barb's quilt is on the left wall and mine is on the right. Same pattern ...just two color ways, showing what a difference a color palette can make. Mine uses our fabric line from Cinnamon Spice and Barb's uses a tan floral print from Cinnamon Spice (shown below) and a mixture of other prints for the flowers and leaves. Her leaves are shades of dark green....I know they look black in the above picture but they aren't. I will try and get a close-up for you tomorrow. What a fun contest for 12/12/12. Please include me in your drawing. I love Moda fabrics. As if I need more for my stash!!! I use charm packs to make smalls and to back my stitched pieces. What a wonderful Christmas gift for someone. Thank you for the opportunity. Hi...Thankk you for the opportunity! Count me in! I will just have to wait until March when your book comes out; I am intrigued by the quilt in the middle of the photo. Magnifique ! Hope I win ! I am so happy to see some posts on your blog, I have been waiting eagerly for one. Great fabric and so generous an offer. Please enter my name into the draw. Thank you for this opportunity to win these fabrics. Please enter my anme. Gorgeous fabrics! Thanks so much for the chance to win. I love your cross stitch designs and now I get an opportunity for some quilt fabric!!! Thanks for the opportunity!! I would love more fabric. Please add me to your 12/12/12 contest list! I'm also anxious for your new book (the preview posted several days ago) due out around Christmas! What fun items to look forward to! The new quilts looks wonderful. Thank you for offering your giveaway. They look yummy I would love to try them. The quilts, both colorways, are just lovely! Your new book is now on my must-have wish list! Roll on March for the new pattern! Love both colour ways of the pattern. Fabric choice makes such a difference. Thanks for the opportunity in your giveaway. Thank you for this opportunity to win these fabrics. Please enter my name. So glad to see your new posts! Would love to win the charm pack -- I'm a newby to quilting and this sure would help my stash! Please include me. It's good to see an update! Wow a great give away! I have been hoping to come across some of these little fabric bundles but there are none in the stores here yet! It's always fun to see the same pattern in the different colorways! Barb's could be for Fall-Winter and yours could be for Spring-Summer? Looks to be a good variety in the moda fabric packs... Please enter me for a chance to win! How cute layed out in the Christmas Tree form - lovely and generous give away. What a wonderful give away! Thank you. Oh it would be so much FUN to win and then spend the time with a quilting friend deciding om what to make with them! I was following quilt mart on line and watched the venue videos and your booth was fabulous with your new quilts (as always) I also remember they were having other designers making projects out of these wonderful squares of quilters candy. Thanks so much for the chance to win! Gorgeous fabric. What a lovely booth ya'll had. Also that was very nice of the other designers to give you sample packs of fabrics. Thank you for the change to win these beauties. Have a safe Merry Christmas and Very joyous New Year. I would love to win the Moda Candy Christmas tree! Thanks for the contest! delicious sampling of the new fabrics! love the candy pax! thanx for your efforts to bing us this chance to win them. I've missed you posts..glad to see you back!! Love the littlefabric treats! So pleased to see a post - I've been checking regularly to get my fix of Blackbird ideas and inspiration. What a lovely prize - I'd love to be included. Thank you. Nummy little candies! So nice of you to share those and photos of your booth for those of us who were not able to attend Fall Market. Oh yes, please! What a wonderful draw, thanks for the opportunity! Knowing how busy you are thank you for thinking of us and doing a giveway. Obrigada pela generosidade.Ficaria muuuito feliz se viesse para minha casa. I have missed your blogging. As usual can't wait to get my hands on the new loose feathers book. Thanks for a chance in the giveaway. Lovely fabrics. Generous of the designers and you to share. You must have a lot of friends. Thanks to them and to you for the giveaway. The quilts are amazing. I can't wait to see the book in March. Thank you for the chance to win the fabrics and Happy Holidays to you and your family. What a nice give away! ohhh lovely! I'd love to be included in your drawing. I've been sewing your patterns and commenting on your blog for years. Maybe this is my lucky day to be the winner! Thank you for the giveaway. I love this size. Please include me in your lovely giveaway! Lovely little pieces of fabric to play with! Thanks for the giveaway. Please enter me...I love Moda fabrics. How fun are these little packs of fabric! I could have so much fun. Lovely contest and maybe I have a chance of winning. The fabrics all look wonderful. How fun - the prints look lovely and would be nice to play with. Thanks for the chance. Love Moda fabrics! I also love the applique quilts, will be looking for your book in the future. Oh those quilts look wonderful. I can't wait to see your new book! Thanks for the chance to win some Moda fabrics! Happy Holidays! Moda Candy! So addicting, isn't it? Love to win those. Count me in please. Thanks for the chance. The quilts look wonderful! Can't wait for the new book! I'd love to add these to my stash! Winning would be a delicious treat...thank you for the giveaway! Love the fabrics! Please count me in. Thanks so much! I am looking forward to the new quilt book. Your designs are always new and fun. Thank you for the give-a-way opportunity. Alma I would love to be entered in your drawing. What fun... Thanks so much! Happy holidays to you and Barb!! I am looking forward to your new book! I would like to participate in your give-away. So glad to have an update. And a contest to! How fun. I would love a chance to win some of these wonderful fabrics. The new Loose Feather's looks great! I can hardly wait. Yummy fabrics! Beautiful quilts! Thanks for the chance to win samples. By the way, your antique ornaments are wonderful. Please count me in! I'd love to win all those gorgeous fabrics! Thanks. What a wonderfu giveway! Thank you for the opportunity to win these fantastic fabrics. Have a Merry Christmas! Thank you for the opportunity to win!!! I am a HUGE Moda fan. :) Thanks again! Wonderful photos here; please include me too in the drawing! No calories! How perfect and perfectly beautiful new quilts. I can't wait for the next book. 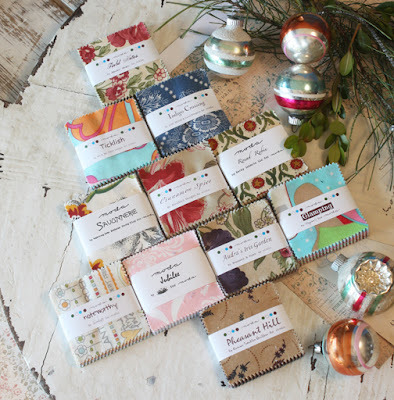 Moda fabric is my favorite, and I'd love to win those cute little candy packs. 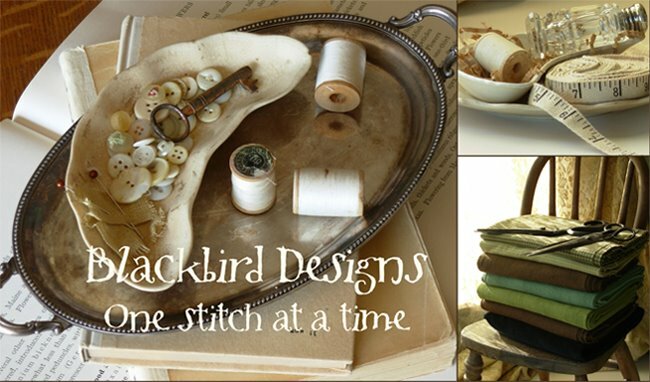 Love your blog and gorgeous projects! would love to be included in the charm square pack drawing too! Thanks for hosting a giveaway! They're lovely. What lovely fabrics! Please include me in the drawing! So ...do any of us have a clue ? The time it takes for you and Barb to complete a quilt (with same pattern). I am crazy in love with both creations. I love non caloric candy I mean charm packs! so happy you are blogging again! How Fun! I would love to win these!!! Thanks for the chance. Both quilts are beautiful!! (also love your new stitching designs from yesterday's post) Thanks for the giveaway & Merry Christmas to you both!! I would love to win these! I'm on a fabric diet and the only way I can get some of the new lines is to win them. Thanks for the chance. Ack! I love that quilt! Both versions of it! Gorgeous! Of course. :D Thanks for the giveaway. It's so nice to see posts from you again! Love the last Loose Feathers too! What a wonderful giveaway! Would love to win! The quilts from your new book are lovely! What a wonderful Christmas it would be if I won all those pretty fabric squares! I love those little candy packs. Please enter me. Thanks for the giveaway chance - looks like some great fabric! Those little packages of fabric goodness are so much fun! Thanks for the giveaway. Merry Christmas! How Sweet! I love Moda charm packs and use many of them to accent my cross stitch ornies. Thank you for such a generous gift! please add my name in the drawing. Ooh, I'd love to win those little quilter's candies! 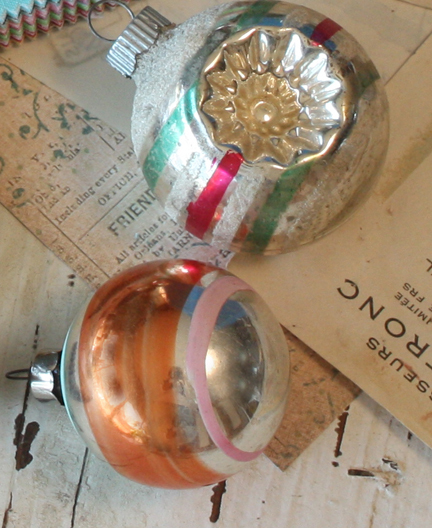 And I have those very same ornaments! LOL - what a cute tree! I love KC Star quilts, look forward to seeing your new book. Thanks for a wonderful give-away and thanks for the change to win these candy packs. What a lovely fabrics you have in the give away. Your quilts are both very beautifull, I love applique quilts. Love your designs and fabrics..would love a chance to win the prize! Thanks for the chance to win the little sampler packs. They are so much fun to play with! Oh my, what gorgeous quilts in your booth! I love Moda fabrics and would love the opportunity to win some packs. Thank you so much. Thanks for a chance to win some of this pretty fabric!! THanks for the great giveaway. I love both fabric colorways and both quilts. I LOVE your Cinnamon Spice fabric collection. I love your books and after seeing a picture of your new quilts .... just HAVE to get the new one as soon as it's released. thanks for the generous give-away! I love the antique Christmas ornaments. I have been looking for the book, and now I know when to find it! I will be looking for the new cross stitch book this month. Merry Christmas to you and Barb! I better get a move on and finish my Country Inn quilt... so March will be my deadline.. I can do that. Thanks for a chance at your giveaway. Lovely quilts and lovely fabric. I would love to be included in your drawing. I love your fabrics, quilts and cross stitch designs. I am an avid collector of all things BBD! So glad you are back. I have Cinnamon Spice all lined up here for the new book. Can't tell you how many times I've watched your Youtube interview with the quilts at Quilt Market. Wow, love those beautiful pack of fabrics! Love a chance to win them, thank you! If your prize is open to overseas followers then I would love the chance to enter for your giveaway. Thanks. I'd love a chance to win your giveaway. Thanks so much! I look forward to seeing your book come out - have just about all of your quilt books and am working on a two different quilts from two different books. Oh my those little bundles of candy look yummy!! Thanks for the chance! I'd love to be entered in your draw. Can't wait until your next book is released to add to my collection. I love your blog. Thanks for a chance at the give away. Need some stash to finish up some on going projects--these would be helpful! Can't wait for your new book to come out! I always find something lovely to make from them, and of course thank you for the chance to win the lovely samples! What a fun scape quilt these would make. Please include me in your drawing. What a pretty collection of Moda fabrics. I would love to call these mine. Happy quilting. I would love to win these fabbies! Your fabrics are always lovely, but I love all Moda lines, so would love to be the receipient of this giveaway! Thank you and happy holidays! Thanks for the give away. Those Moda Candies are cute. Love both of your quilts. I loved your last book so I know I will like this one! Thank you for the chance to win these lovely fabrics. Oh, what a great giveaway! these would be perfect for a Postage Stamp Quilt I'm working on! I've got the perfect project for them! Thanks for the contest. Oh how yummy these candies look! I could just eat them all up! Thanks for letting me drool. What a great contest! Thank you so much for the chance. Just what we need!!! A little MOda christmas candy! Happy holidays!!! Sweet! Thanks for the opportunity!!! what a great and generous contest! Your quilt design is lovely! How I will enjoy those charm packs when I win them! Oh! Thank you for the chance to win those gorgeous fabric bundles. Just plain lovely~! *Both* of them. I should be finishing decorating the tree instead of being on the computer. Maybe I'll win and it'll be okay (that I was on the computer). Wow! Please enter me for your drawing and Merry Christmas! Merry Christmas Happy Holidays Happy New Year!!!! Blurry or not, it's always a good thing to see your beautiful quilts. Thanks for the fun giveaway! I'm so glad you're blogging again. Hip hip hurray! Yes, please entry me in your fabric give-away. Learning to quilt and am trying to build a stash. Would love to be included in your drawing. Thanks!! Can't wait for your new book (even though will have to wait longer!). Thanks for your giveaway. How nice of you to be thinking of a giveaway for us when you were at Quilt Market! The fabrics look great and i would like to be included in the drawing. Would love to win. Thanks for offering this nice gift. The Moda fabrics are beautiful! I would love to enter for a chance. Thank you! happy Holidays to you and your family! Lovely giveaway, please include me! Thank you, Beth n.
I love days like 12-12-12 or 1-2-34! Thanks for the chance to win! Oh Alma! What a nice surprise! Thank you (and the other designers) for your generosity. Someone is going to be soooo happy :) Please enter me for a chance to win. I'm looking forward to your next publication/patterns - I always love your style. Thanks for the chance at what would be a fabulous Christmas gift. Happy holidays to you and your family. Cute candy packs! Would love the opportunity to win...Thank you! Every time I see photos of your quilts, I marvel! You are amazing human beings! It's nice to be reading your blog again, and thanks for the chance to win a fun prize. My goodness, what a difference with the 2 quilts, I love seeing the same design in different colour ways and reminds me that I don't have to make anything like the sample, but can stretch my wings. So cute. Thanks for the chance to win them. THanks for a chance to win. I love the candy! How wonderful! Please include me and thank you. omg a give away!!! Include me and please try and pick me! Please include me in the drawing to win one of these sweeties! Great fabrics! Can't wait to see your new patterns! Lovely quilts in your new book. Thanks for the opportunity to win some cute candy packs. A girl can never have enough candy. You are fabulous. Merry Christmas too. What a generous giveaway! I'd love a chance to win! Looking forward to seeing your next book. These little fabric sachets are wonderful for doll quilts. Thanks for "giving" in this magical of seasons! Please enter me in your contest. I love your cross stitch and quilting designs. Your booth looks amazing! Thanks for the opportunity to win. I love your stuff.